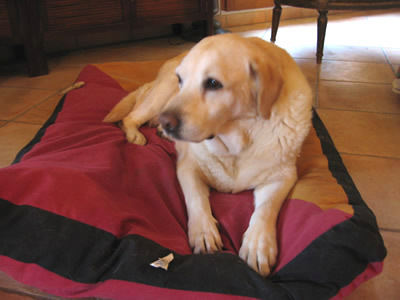 Flavia is a yellow labrador and came to me en pension about three years ago. She was then about 10 years old. Flavia had been trained as a Guide Dog for the Blind and had lived happily guiding her owner until she was 6 and half years old when sadly her owner died. She was returned to the Guide Dog School where she was found a happy home in Nice with a fireman and his wife and where she lived until she was 9 and half years old. By then, she'd become exceedingly fat. Unfortunately the couple divorced and once again Flavia was sent back to the Guide Dog School. She was then found a new home with a older lady but it really wasn't suitable. Fortunately a family member realised there was a problem and I was recommended to her by a veterinary surgeon. When Flavia was brought to me, she waddled down the track weighing in at over 50 kilos and with a rather nasty eye infection which hadn't been responding to treatment. I was asked to look after her for six months, get weight off her, get her bad eye tended to and then the family member would try and find her anew home. Eventually Flavia went to Dr. Gaiddon, the dog eye specialist in Cannes, who actually saved her eye and even to this day she has three different drops in that eye, twice a day which will continue for all her life. After about six weeks, I realised Flavia wouldn't be going anywhere - she'd stolen my heart - I asked the lady who'd brought her to me if she'd be happy at my adopting her and that is what happened. I shall always appreciate the kindness of this lady, the family member, who brought me several enormous sacks of diet dog food over those first few months. Flavia is now a trim 32 kilos and is nearly 15 years old. She does have a few aches and pains tho and this is kept under control with Rimadyl. Every year at the annual meeting and dinner of the New England Old English Sheepdog Rescue in America, they offer a Home of the Year award: "The Annie Raker Rescue Award is offered annually to a home which, in our opinion, has committed to the challenge of an Old English Sheepdog requiring special care and consideration. This home has responded to unusual behavioural and/or medical problems and has shown a willingness to alter lifestyle in order to accommodate their family member. The silver Paul Revere bowl will be engraved by the New England OES Rescue, Inc. and awarded at the annual meeting. The recipient will maintain the bowl for one year." This year (2003) the award (there were 65 candidates) has gone to Chris and Cynthia Haddock, owners of Sheba, a thirteen and a half year old OES in tribute to their effort and tenacity in getting Sheba to England without her going into quarantine. (Note: this is before the change in regulations) They were in a desperate situation in June 2002 when they had to return to the UK from the States, but had been advised by their American vet that Sheba would not survive 6 months in quarantine. Sheba’s story tells of a desperate search for a solution but to no avail and eventually they were faced with the possibility they may have to put their beloved family member to sleep should no suitable home be found in time. Fortunately wonderful Grannie Annie Raker came to the rescue and because we’d met when I judged the National Specialty in Rhode Island in 1999, she knew I cared for dogs in my home – so that’s where I came into Sheba’s story. 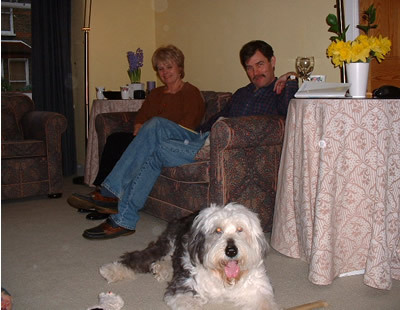 We are a British couple with no children, and a wonderful Old English Sheepdog, Sheba. She is our second OES. The first one was our wedding present to each other in 1976. She lived until she was 12. A few months later Sheba, aged 8 weeks, came into our lives. In 1998 we were offered the opportunity to work in the USA for 3 to 5 years. Sheba was 9 and there was no question in our minds but that she would come with us. We did think about the challenge of bringing her back even then, but the harsh UK quarantine law was already being relaxed for countries in the EC and everyone said it would be relaxed for the US next. We just hoped that that would happen soon or that Sheba would not outlive our stay in the US. After 4 years, with Sheba aged 13 and healthy, one of us, the main earner, lost our job on 15th May, one of the many aftermaths of September 11th. Our visas were tied to our jobs. We decided our best opportunities for employment were back in the UK, and we wanted to come home. There were many challenges involved in this decision as we were in the middle of moving form DC to New York City, and had just signed a 2 year lease in Manhattan, but none of these were as distressing as what to do about Sheba. The UK quarantine law had not been changed. Should we put her in quarantine in the UK after all? Would the law be changed in time so we could bring her straight home with us? Could we get an exception from the British Government if not? Could we find someone in the US to give her to, preferably someone we knew? We were very clear that our criterion had to be what was in Sheba’s best interests. We pursued all these avenues in parallel. Our first preferred option was to give her away to a loving family, avoiding the trauma of a transatlantic flight and quarantine. Devastated as we would be to go home without her, leaving her so far away, we felt this was best for Sheba. We approached some friends, who had said a few weeks before we knew we had to leave, that if ever we had to go home in a hurry, they would take Sheba. We left her with them and their own 12 year old dog for a few days. We returned on 30th May to hear the sad news that although the dogs got on well they had decided that they couldn’t cope with 2 dogs with their life styles. We bless the generosity and honesty of our friends. Sheba would not survive the harsh conditions of UK quarantine. (Our view also). She would pine unless we could personally see her every day and feed her. Looking at the locations, this would mean a 2 hour round trip every day which was not practical for 2 people looking for jobs. He was at that time concerned about a transatlantic flight, which he felt could have an adverse affect on her kidneys. He declared her heart and reflexes to be good, and her weight ideal. He ignored, not surprisingly at this point, the question of putting her down. Our view was we could be with her until the end, acknowledging this would be premature, but we had shared a longer than expected partnership for her breed. She would not be put through any trauma or separation. And we would not have the anxiety about what was happening to her, although we would have the guilt of putting down a reasonably healthy dog. The vet shook his head sadly at the prospect of finding some one who would take on a 13 year old dog, a prophetic viewpoint. Nevertheless, everyone in the surgery became committed to trying to find a home for Sheba including the customers who were in that day. They made phone calls and put up an advertisement and gave phone numbers and web sites. That afternoon we called another vet in New York recommended to us as his wife operated a dog placement service. She said she wouldn’t have a hope of placing a 13 year old dog. At our lowest point we started the next day, Sunday 2 June, to make calls and do Internet research. There were dire warnings about advertising dogs for sale, which could be bought under pretence for research purposes, and there were descriptions of rescue organizations where the dogs were put down after a few weeks if they weren’t placed. We tried organizations saying they specialized in senior dogs, but didn’t get much response. That afternoon we sent dozens of e-mails to friends and former colleagues begging them to help find a home for Sheba. We had taken photos of her that morning and a neighbor scanned them for us. At 7.00 that evening Annie Raker, or Grannie Annie as we’ve come to know her, of the NEOES Rescue answered our call. She heard our story and was determined to help us find a solution. The next morning we received e-mail from Annie forwarding a message from a friend in France, Jilly Bennett, a former breeder and current judge of OES. Jilly runs a boarding establishment where the dogs live in her house, sit on her sofas and sleep on her bed if needs be! She has a terraced garden, fenced for them to roam in. She had taken a dog in our situation from Canada, cared for it for the regulatory 6 months and got it ready to meet the UK Pet Passport regulations. The owners then collected it and brought it into the UK free of quarantine restrictions. Jilly’s note filled us with confidence that this was a real solution as she described every detail of what would need to be done. She sent us photos of happy dogs all over her home. There were a few reservations initially. Sheba would still have to survive a transatlantic flight. She would be apart from us for 6 months, unless we could visit her, and she may not live the 6 months for age reasons, however caring the conditions. Then there was the cost to consider at a time we would both be out of work. So friends continued the search for a US home We got the British Embassy in Washington DC to contact the UK government on our behalf to see when the quarantine rules would be changing (there were reports in the press that they would change soon), and if an exception could be made. Our friend in the UK, a former OES owner who had been monitoring the legislation all the time we were in the US, also worked tirelessly to get a response from the government. It’s been announced the law will change this year but in practical terms it was too late for us. We heard an exception could not be made unless we the owners had a life threatening illness. During the next week we started a phone and e-mail conversation with Jilly and started to investigate the practicalities of taking Sheba to live with her in France. We contacted the airlines and triple checked the requirements for flying a dog to Nice, and the French embassy for entry regulations. We would need to fly to Paris from New York, hire a car and travel through France with Sheba, stay near Jilly near her home to settle Sheba in and then fly on home to London. All in all about a week’s journey at the height of the holiday season. We also sought advice from the vet again, to go through all the options with him, and we needed a health certificate. The vet’s main concern at this point was whether Sheba would pine away from us, but we had got to know Jilly well enough in the last week to reassure him this was most unlikely. And how right we were! There and then Sheba had her rabies jab and blood and urine tests taken and flown to New York. Next day the vet pronounced her fit to travel, her blood was excellent and urine fine, and issued the health certificate. We called our trusted friend in the UK, went through the options again with her and she agreed that taking Sheba to Jilly was in her best interests. Next day we sent an e-mail to Jilly and to Annie “Sheba is coming to France” and our hearts lifted for the first time in weeks. It was one thing to lose a job and leave a country prematurely, another thing entirely to lose a dog. Even if she didn’t survive the 6 months we were putting her in the best environment possible. Jilly knew we were concerned about Sheba’s longevity and wanted to know her pedigree, as some lines seem to live longer than others. Imagine our surprise when Jilly said she knew Sheba’s father and grandfather and great-grandfather and had given them CC’s (championship certificates towards their titles) in the ring. She had also met Sheba’s brother, no longer alive, who had lived in Barcelona! It felt really that Sheba was meant to be with Jilly. We went to France in early October to see Sheba and Jilly, just under half way through her stay and then we went in January, bringing her back to London. She may not have thanked us for taking her away from her new home and dog friends in the sunny south of France for the cold gray English winter……..!! 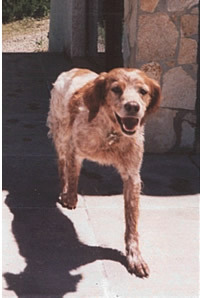 Sheba stayed with me, here in France, from July 2002 until January 2003. She slept in my bedroom and kept a careful eye on me in my study whilst I worked at the computer and did her best to keep the other dogs in order. Chris and Cynthia came to collect her at the end of January, 2003. For me, it was wonderful having an Old English Sheepdog around the place again and Sheba in particular. We don’t see many OES on the Côte d’Azur – there is one at a flower shop and occasionally I see one walking along the seafront and of course I get a treat when we have the Riviera circuit down here – the three shows that take place in May - (Monaco, St. Remo and Frejus) – then my terrace is crowded with Old English Sheepdog showdogs from Holland, Italy, Germany, all over. Sheba was the sweetest dog, stuck to me like glue and I had my fair share of bobtail kisses I’m happy to say. I also enjoyed grooming a bobtail again and remember how relaxing I used to find it and what a pleasure it was to make a dog look so beautiful. It wasn’t an easy ride tho – Sheba had knee surgery on both knees earlier in her life so she’s arthritic and many times I had to help her up off the floor. She’s also suffered from cystitis several times in her life, so was on a special diet. However, a month or so after arriving she contracted a bad urinary infection and had urinary crystals, all of which caused quite bad incontinence. Not easy for her or for me. Eventually, she was diagnosed as having Cushing’s Disease and once we had the correct diagnosis, it was easy to control the incontinence with drugs. Sheba, despite all this, was such a happy soul and provided she got her food – and she let me know she wanted it and NOW please, her biccies and her morning toast – she was a happy camper. There are always challenges with any geriatric dog, but we all know how rewarding it can be. Cynthia and Chris flew down to Nice to visit for a long weekend at the beginning of October. They were concerned that Sheba would be upset when they left but fortunately she settled back into the system here immediately. Then, in January, the big day came when Chris and Cynthia came down to take Sheba back to London with them. A happy day for them but I confess I shed a tear saying goodbye to a dog who had become ‘my Sheba’ for a time. I sat on the terrace and stared at the dog, totally ignoring the wonderful view down a cool green valley to the sparkling blue Mediterranean Sea beyond. –Chippie has a very sweet nature” said Jilly Bennett of Pension Milou, a five-star (and you'd better believe it) Pension Familiale for dogs. I nodded and continued staring at the back of a small orange and white Brittany Spaniel stretched out in the sun before me. 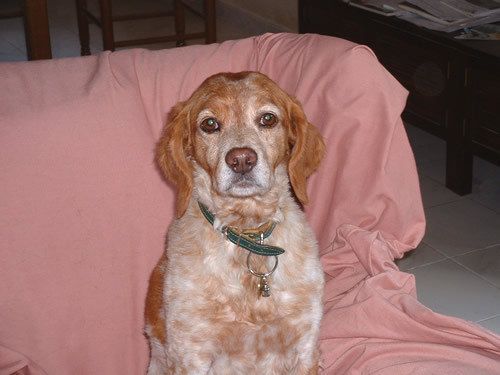 The spaniel's owner had died suddenly and the family had no desire to take care of her. Jilly had been minding her at the time and now she took it on herself to find Chippie a better home than the proposed shelter. I had first read Jilly’s notice on Angloinfo.com and while I have bought lots of things over the internet, such as ink cartridges and DVDs, I would never have considered buying anything as serious as a dog. But here I was and Jilly was very nice. Soon I found myself liking and trusting her, however I was here to adopt the dog, not Jilly! The only way to know if things would work out was to bring Chippie home and wait a few weeks. Jilly gave me dog food to get started, a leash and lots of great advice. She emailed me many times a day for the first few days, making sure dog and owner were doing ok. Her support was very valuable because the first few days were odd. It had been twenty years since I last had a dog and I was nervous. Also, Chippie couldn’t or wouldn’t respond to my voice. Her previous owner had been French so I tried calling out “Chippie” in a French accent. My concerned neighbours shouted over the fence, was I ok ? Since my “Ch” sounds obviously cut no moutarde with my dog, I tried a new approach. I made every sound I knew until I saw her respond to “Fee”. Now we were getting places. She likes to catch flies (no kidding) and garlic sends her fleeing from the kitchen so I named her “Renfield” after Dracula’s fly-eating garlic-hating assistant. Then, since the name weighed almost as much as she did, I shortened it to “Fifi” and she’s been “Fifi” ever since. She’s been with us for 18 months now and her character has re-emerged in Tsunami-like waves. She is a twelve kilo nose machine. Put her on a leash and she hangs at the very end, like a trapeze artist in a harness. A friend returned from taking her for a walk recently and announced that walking Fifi felt like waterskiing. However, take her to a restaurant and she sits patiently under the table, front paws crossed like a Menton princess, turning heads with her charm. Being French, she never gets ready to leave until she senses our coffee has arrived and even then, she gives us plenty of time to get our act together. To ward off local hunters, I put a tiny little bell on her collar. It’s actually a cat-bell but I don’t think she knows that. All the other dogs must say to themselves, “Ah here comes the cat who barks”. She has befriended the two labs next door although I’m proud to say she leaves them miles behind when they play. She runs like a whippet and can stop on a dime. When I get migraines she curls up beside me and doesn’t leave my side until I feel better. She stretches out across the couch when we watch movies, although she spends more time watching the popcorn than the screen! As for my husband and me… fluffy dog beds are now scattered throughout our previously minimalist house. We’ll never buy another car with dark upholstery again. What’s more, I pity anyone waiting in line behind me for the car vacuum at the local car wash. But more than that, I pity anyone who doesn’t have a companion like Fifi. You see, she’s sleeping at the moment and her head is resting on my foot. Thank you so much, Jilly.